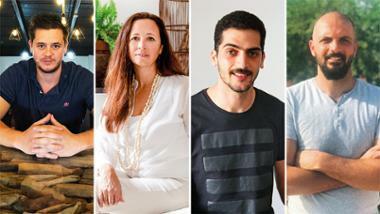 Side-stepping haphazardly-stacked cardboard cartons, a set of bottles and jars, then a massive wooden chest, Maryam Bin Fahd makes her way carefully to her desk in her office at the Dubai Municipality in Deira. ‘I only recently shifted to this office on the fourth floor and am yet to organise the stuff I’ve been collecting over the years,’ says the director of Dubai Municipality’s knowledge management department, pointing to the cartons and the chest in the room. The ‘stuff’ she is referring to are coins. Hundreds of thousands of them. From almost every country in the world. And in just about every denomination available. Segregated and packed in boxes and plastic bags, bottles and even a wooden box not unlike a pirate’s treasure chest, the coins, including a few hundred in a large bowl on the coffee table in her cabin, jostle for space among scores of honours and citations that her department has received, apart from files and regular office material. Attempting to make herself comfortable at her desk, Maryam bends down, fidgeting with something near her feet. ‘It’s a few sacks of coins that I’ve just finished sorting and labelling,’ she says, dragging the bags into a corner so she has enough space to stretch her legs. It was three years ago that the coins started dropping into the Currency Charity Bank, an initiative launched by Dubai Municipality that was spearheaded by Maryam. 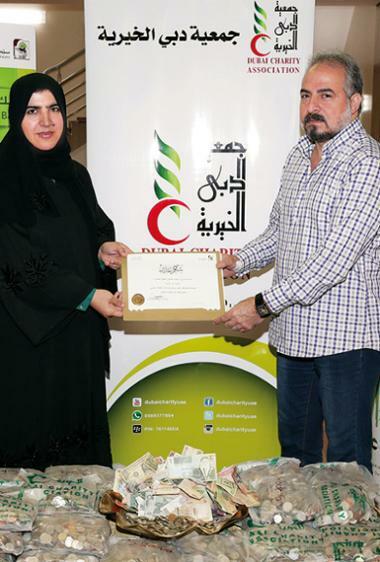 Reaching out to a few charities, individuals and corporate houses in the UAE, she urged them to donate foreign change to her programme, planning to hand it over to the Emirates Airline Foundation, a charity that supports needs of less privileged children in the world. 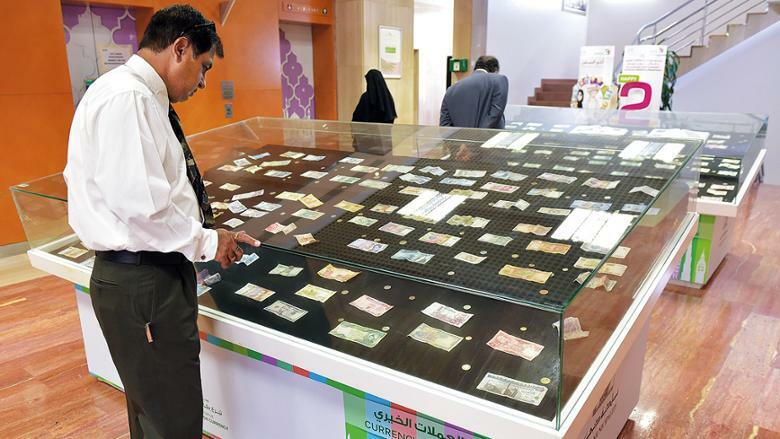 While the bulk of the coins collected goes to the foundation, the rare and archival-worthy coins are saved to be displayed in a permanent exhibition hall in the UAE soon. So, just how many coins has she collected over the years? Maryam realised early in life that ‘if you ask people for money, not all might be able to give. But if you ask them to donate used books or some unused clothes or, as in my pet project, loose change they brought back from a country they visited, they are very likely to do so’. The coin collection drive began quite by chance. ‘I love travelling and so does my husband. He, in fact, travels regularly for short periods of time.’ And every time her husband returned from his travels, he would have at least a handful of loose change from the country he visited. The coins would lie unused in a drawer at home. ‘There were occasions when he would revisit some of those countries but would forget to take along the change so they would lie there, pretty much useless for anyone,’ she says. Maryam herself recalls visiting India and returning with some loose change ‘which is still lying around in one drawer at home’. The pattern was repeated when she returned with a few wons after visiting South Korea, bahts from Thailand, dollars from Singapore… ‘Although I visited Thailand a few more times, I never got to use the bahts that I had at home simply because I’d forget to take them along. 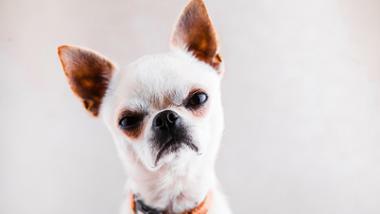 ‘I used to keep asking my husband what we could do with them, but could not zero in on anything,’ she says. Although the kids were interested initially, their enthusiasm could not be sustained. That set her thinking. 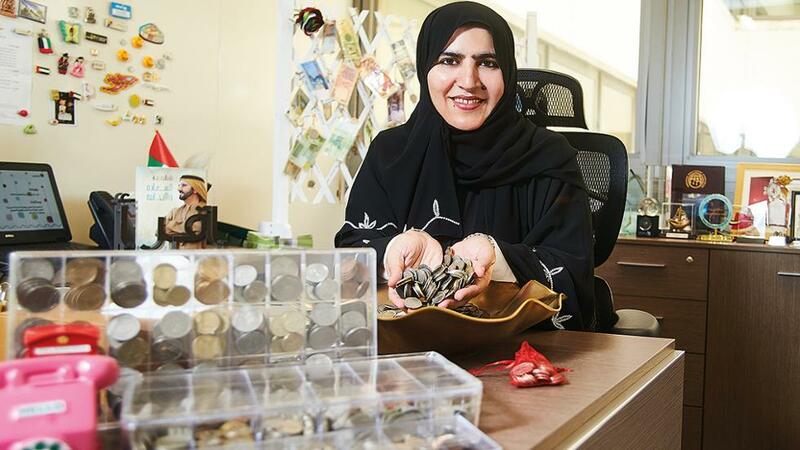 She remembered seeing coins from different countries in charity boxes across the UAE and wondered what happened to those coins once the boxes were opened and the currencies segregated. A few phone calls and she was in for another surprise. 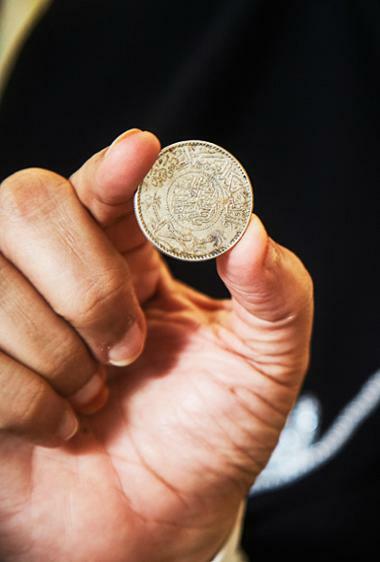 ‘I was told that the coins that were not accepted by banks here were sold to the highest bidder in an auction.’ Depending on the mix, the coins were sold for Dh50 to Dh80 per kilo. Keen to use the coins in a better way, she did some brainstorming. ‘While flying on Emirates, I’d seen passengers deposit loose change or notes in envelopes for a charity. That set me thinking,’ she says. 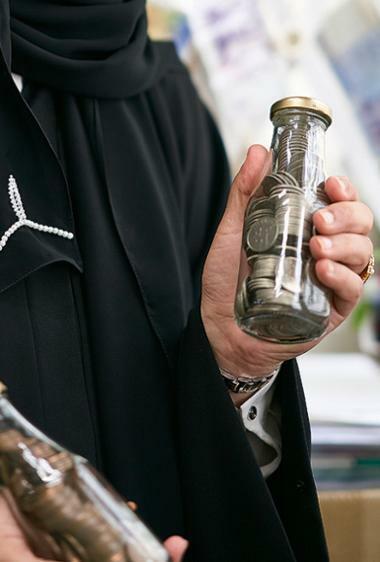 After discussions with the then Director General of Dubai Municipality Hussain Nasser Lootah, Maryam formulated the initiative called Currency Charity Bank. She contacted Emirates Airline Foundation and asked if they would accept loose change of any currency. ‘They said “of course we will. Please send them over,’’ says Maryam. The same year, Dubai Municipality launched the Currency Charity Bank initiative, setting up charity boxes – similar to those found in malls and other places – at their headquarters in Deira. Soon the initiative was expanded, with collection boxes in more points in the city. Maryam would arrange to collect the coins, segregate them according to the countries of origin, and send them off to the foundation, where it would be used to help fund the educational and medical needs of poor children in developing countries. Wanting to take it to the next level, Maryam also got in touch with a few charity houses in the UAE and requested them to send her the coins they received that were not accepted by local banks. It did not take long for word to spread and soon apart from sack loads of coins, requests from people wanting to volunteer started to pour in. From teenage students in Dubai offering to sort out coins during their summer break to hotel housekeeping staff who wanted to donate loose change that they received as tips from guests, people cutting across boundaries offered to help. Thanks to his goading, Maryam contacted a few major hotel chains in Dubai to help her in her mission. ‘Radisson has already joined hands with us,’ she says, proudly. Once a bag of coins arrives from a charity organisation or a corporate house, Maryam gets busy filtering it. ‘I often stay back here after office hours to segregate the coins.’ A helper in her office assists her, as does the help at home. Which is the most cherished coin in her collection? ‘Oh, there are several,’ she says. 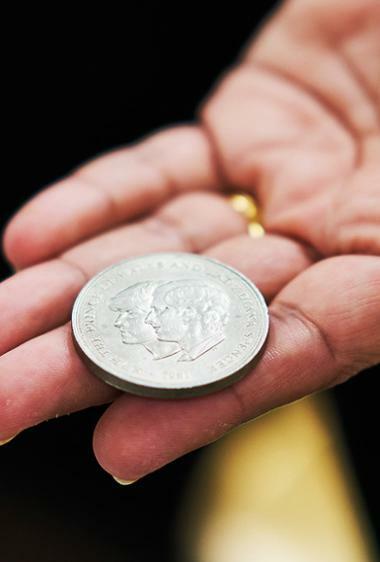 ‘We have a few that were minted during Lady Diana and Prince Charles’ wedding. There’s also one that was minted in Australia for the royal wedding. Maryam and two colleagues quickly set off to the Pepsi factory in Dubai and were pleasantly ‘surprised to see more than 2 tons of coins, which they were happy to give us’. 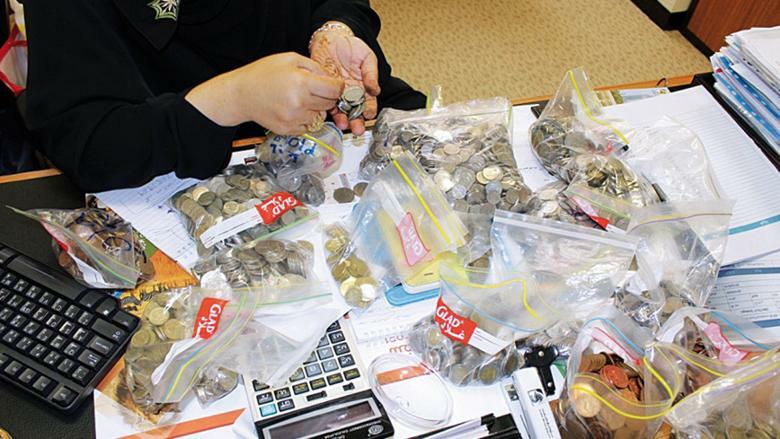 Earlier this year, Coca-Cola too chipped in, handing over a few bags of foreign coins to the charity. More trivia. Thai coins, she says, are unique because they do not have a date on them. The largest banknote was issued in 14th-century China during the Ming Dynasty. It was 1 Yuan and was 22.8cm by 33cm. The smallest banknote, incidentally, was issued in Romania in the early 20th century. It was a 10 bani note, which was just 2.2cm by 3.8cm. Maryam’s dream is to have a separate building to house the collection of coins and currency notes that the charity has collected over the years. ‘I am planning to have an exhibition of coins and currencies at the UAE Central Bank. 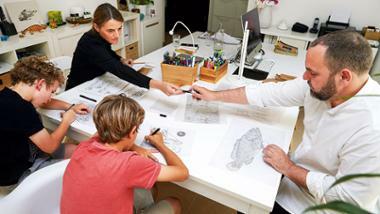 It will offer people a peek into the history of the evolution of currency.